A Gurn from Nurn: How much more development can the A96 take? And specifically as regards to the section through Nairn. The present plan for Sandown is for 550 houses, how many more cars would that be, 500, 700 or even over a thousand. The Sandown scheme is only one of a few major housing projects envisaged for the area. Is it wise to have any more major housing schemes until something is done to improve the transport infrastructure? Time for another protest march? 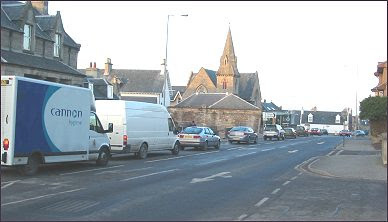 The picture was taken today about 16.30, not even the rush hour yet and traffic backs up to get on the King Street roundabout as queues start from the Lochloy/Broad Hill junction and head back right through the town. PS update before the cup of tea, a member of the Gurn staff has just returned to the town and reports traffic having to slow down to a crawl this evening from the former Delnies school into town. Wouldn't a controlled level crossing and a roundabout as proposed at the Sandown suburb just be the icing on the A96 motoring cake?